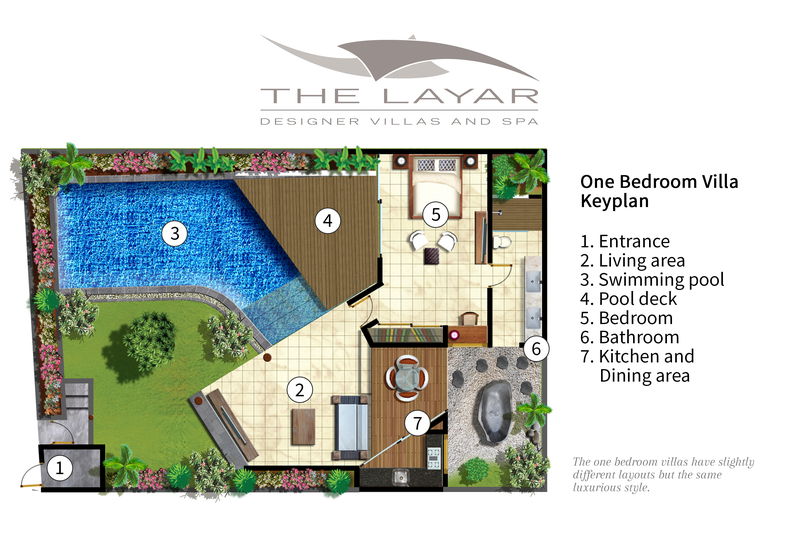 At each of The Layar’s four one-bedroom villas, steps to the elevated garden follow the curve of the swimming pool to the open living and dining area spread out below the wing of the dramatically sloping ironwood-shingle roof. To one side of the living area lies the triangular galley kitchen, while to the other, angled under the second roof wing, is the spacious bedroom and its ensuite garden bathroom. Careful thought has been given to the villa’s romantic living area, resulting in a wonderful sense of space, openness and flow that couples will appreciate. With such a splendid selection of settings to chose from, relaxation comes easy, day or night. Drift between the custom-designed teakwood sofa facing the entertainment centre, the sun-loungers reclining on the pool deck, the tiered shallow section of the pool just beyond the living area, or even the stone bathtub gracing the courtyard garden. Honeymooners and couples will love the design of this large, light-filled king-sized bedroom with its stylish seating area, window onto the courtyard and sliding doors to the pool deck. There’s no scrimping on space in the garden bathroom either – an elegant expanse of Palimanan stone with foliage-fringed shower, elongated counter with twin basis, and – in the adjacent white-pebbled courtyard – a decadently statuesque stone bathtub.